There's an old rocket complex called Alcantara near Brazil's Atlantic coast. After the U.S. signed a technology safeguards agreement (TSA) with Brazil, American space companies may be able to use Alcantara. Launching from the equator could save rocket companies fuel because of shorter flights. 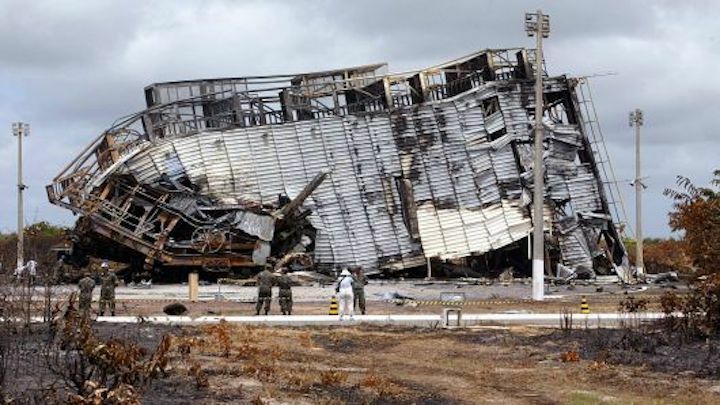 General view of the wreckage of the satellite launch rocket pad at Brazil's space center in Alcantara. The U.S. signed an agreement that would allow American rocket companies to operate from Brazil, possibly unlocking a operations base that has sat dormant for many years, the State Department said Tuesday. An old rocket complex near Brazil's Atlantic coast, called Alcantara, sits about 140 miles south of the Earth's equator, making it a prime location for launching satellites, a $260 billion business. That's because missions from the equator region often require less fuel. "After 20 years of talks we are finalizing a technology safeguards agreement to allow U.S. companies to conduct space launches from Brazil," President Donald Trump said Tuesday at a press conference with Brazil's President Jair Bolsonaro. "Because of the location, tremendous amounts of money would be saved." Alcantara has also drawn recent interest from U.S. space companies. CNBC has reported that in December 2017, representatives for five rocket companies visited the base, including Boeing, Lockheed Martin, SpaceX, Vector and Microcosm. While SpaceX did not share a continued interest in the Brazilian launchpad, and Microcosm could not be reached for comment, the other three companies were still considering the Alcantara option. "Put very simply, the flights are a lot shorter," Trump said. "Brazil's proximity to the equator makes it an ideal launch location." A launch from a latitude much farther north — such as NASA's Kennedy Space Center in Florida or Vandenberg Air Force Base in California — requires rockets to change direction so satellites can reach the equator. The same satellites launched from Alcantara would save as much as 20 percent to 30 percent in fuel, analysts estimate. For decades European competitors have dominated launches from the equator using the Guiana Space Center. Just 345 miles north of the equator, the launch pad is owned by the European Space Agency and operated by the French national space agency. Since the 1980s, Guiana Space Center has given European rocket builder Arianespace a dominant position in the commercial satellite market. The main hurdle to launching from Alcantara, for U.S. companies, was the lack of a Technology Safeguards Agreement (TSA) with Brazil. Such an agreement protects sensitive information about any rockets exported to Brazil. With the agreement signed, companies can take a closer look at the launch site. Vector CEO Jim Cantrell told CNBC last year that Alcantara could serve rising demand for equatorial launches to low Earth orbit, which has been only a small part of the satellite market. Small satellites are usually destined for orbits running over the Earth's poles, rather than the equator. Vector was "very interested in the opportunity" to launch from Alcantara, Cantrell said, because of the fuel efficiency advantage. Vector's small rockets, which are priced at less than $3 million per launch, are looking to tap into the rapidly-growing small satellite industry. Reopening Alcantara would allow U.S. companies to equal the playing field against European competitors. But the Brazilian site isn't ready for rocket launches just yet. Alcantara has been little used since August 2003, when a rocket with two satellites on board exploded on the launchpad, killing 21 people and damaging the launchpad's infrastructure.